Super stop disposable cigarette filters drastically remove tar, nicotine and other hazards from cigarette smoking without altering the taste of your cigarette. 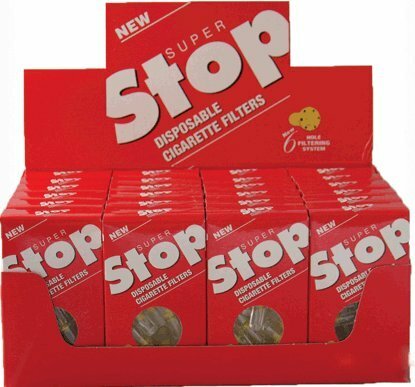 Super Stop filters also reduce nicotine intake which in result reduces nicotine dependency. Since the filters are clear, you can see the amount of tar, nicotine and hazards THAT DO NOT ENTER your lungs which otherwise will stick on your teeth, gums, mouth and lungs. Reduce intake of tar, nicotine and other smoking hazards in to your lungs. Regain natural color of your teeth. If you have any questions about this product by Super Stop, contact us by completing and submitting the form below. If you are looking for a specif part number, please include it with your message.